In this guide we’ll take a look at the best wheelie bin storage solutions for the UK. What Is The Best Wheelie Bin Storage Solution? The Keter Store-It-Out Max is the big brother to the ‘Midi‘ model. Although both are capable of storing two wheelie bins, this one can handle up to 240L per bin, whereas the midi can only hold up to 140L. There is a piston-assisted lid giving you easy access to your bins, as well as double bolts (one main and an added secondary bolt) on the door that enable secure closure. The floor of this bin storage is heavy-duty and quite durable, more than able to support your weight if you need to step in to grab something from the back. Overall, this wheelie bin storage very popular storage solution for larger bins. The Store-It-Out Midi Resin Outdoor Garden Storage from Keter is a great way to hide your wheelie bins. It’s also multi-functional too as it can also be used as a provisional tool shed, or a nice shaded place to keep pet food. As the title suggests, it is made out of resin, which makes it more than capable of withstanding the good old British weather! This wheelie bin storage requires some assembly, nothing out of the ordinary though. Once you’ve put it together, it’s not very heavy either making it easy to maneuver into position next to a wall or fence. Overall, it’s a very natural looking bin storage unit, that’s durable and secure too. 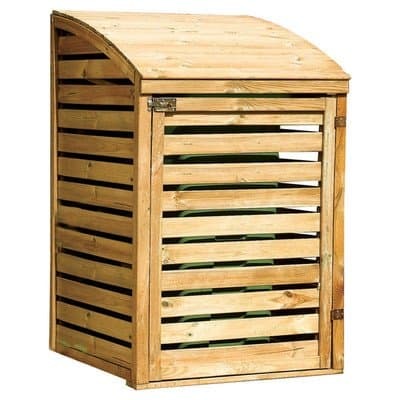 The Wheelie Bin Store from Rowlinson is beautifully designed with its wooden slats and curved top. The structure is made of sturdy, pressure treated wood to protect it from the elements. The fully assembled unit measures in at 81cm x 81cm, and weighs about 30kg – so make sure you have it in place before you assemble it! It’s worth noting that there is no back to the unit, so it’s meant to be positioned against a wall or fence. Overall, this is perhaps the most attractive wheelie bin storage unit on my list and priced very competitively too. This Double Wheelie Bin Screen is hand woven from willow, giving it a very natural look. It’s also fully biodegradable too, if you don’t like the idea of a plastic wheelie bin storage unit. The framework is made of metal, with hinges connecting the side panels. There’s some minimal assembly, which should take you 5 minutes at most. Once you set it up, it will measure 115cm (height) x 80cm (front panel) x 121cm (side panels). It weighs about 11kg, which means no fuss moving it around. It’s worth noting this wheelie bin storage comes as a single and triple too. Overall, it’s an attractive looking screen that’s relatively inexpensive; perfect if you just need to hide one bin. The 3 Wheelie Bin Store from KCT Leisure has a very modern design made with light timber slats. The wood of this triple wheelie bin storage is pressure treated against rot and is perfectly capable of handling the elements. It’s important to note that the storage unit features an open floor design, so it’s best placed on a secure surface, such as gravel or concrete, to prevent foraging animals digging underneath. It fits three standard wheelie bins, and has compartments and individual lids for each. There’s also a nice feature where you can attach each bin lid to the units lid, so that they all open at the same time. The Combi Wooden Chest from Qubox is perhaps the most unique bin store on the list, with a separate compartment for your recycling boxes. Each even has it’s own shelf, to avoid having to stack them. It’s worth noting that it’s not the cheapest wheelie bin storage unit on my list, but you’re paying for convenience and clever design. If you’ve only got one wheelie bin, and recycling boxes, it’s a really smart option. Morcott’s Triple Wheelie Bin Storage is a very nicely designed option if you have three bins. This triple wheelie bin storage is made of pressure treated 3 x 3 heavy duty posts, and guaranteed for 15 years which is quite impressive. The timber originates from ecologically-managed and sustainable sources and the metal handles, latches, hinges and hooks are galvanised and able to withstand weathering. Each bin sections can fit a 540L wheelie bin, and features a top lid that opens independently from the rest. This triple wheelie bin storage is a free-standing unit, so you don’t have to place it against a wall or anything. It’s important to note that the unit is flat packed, but assembles easily with just a screwdriver. It is heavy though, so make sure you put it in position first. The Double 240L Wheelie Bin Chest from Qubox is a very nicely designed wooden bin storage unit. The chest opens from the front, and because your bins sit directly on the ground, it’s easy to wheel them out. It’s made of pressure treated redwood pine, protecting it against rot and fungi. Each section has its own lockable door, as well the option to attach your bin lids to the unit’s lid which is a nice feature. The Quad wheelie bin storage chest from Qubox is a useful option for flats, small hotels, and businesses that have a consistent need for rubbish storage. It’s not easy to store four 240L bins, without dragging the appearance of a place down, but this option really does solve that problem. The Horizontal Garden Shed from Starplast is genuine competitor to the Keter Store-It-Out range, although perhaps not as aesthetically pleasing. It’s made from weather-proof, solid plastic and features four ventilation panels, so you don’t have to worry about getting blasted with a wave of heated and stale air every time you open it. Speaking of which, the bin store opens from the front and top, and sports a heavy duty, hinged and lockable lid. It’s roomy enough to fit two standard wheelie bins, measuring 119cm (height) x 146cm (front panels) x 87cm (side panels), and weighs 33kg. Wheelie Bins – the bane of my life! In my old house I was lucky enough to have a garage to hide them in, but these days I don’t have that luxury. So I’ve had to improvise, and it turns out there are some pretty attractive wheelie bin storage solutions out there. I decided to go for the Keter Store It Out unit, but there are some other great options for you to consider too. I hope this guide has helped you choose the perfect wheelie bin storage unit for your home!